HORRY COUNTY, SC (WMBF) - A statewide meeting was held Wednesday to discuss the shortage of EMT and paramedic-trained professionals in South Carolina. As people age and get sick, and service calls for first responders grow, the need for EMTs and paramedics does as well. 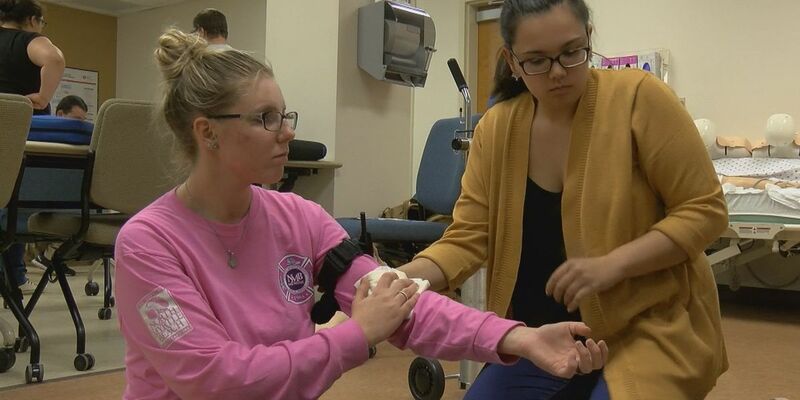 However, a statewide and national shortage is a good thing for people training to be EMTs and paramedics at Horry Georgetown Technical College's program. Scott Cyganiewicz, the program's director, said 100 percent of his students have jobs within two months of graduation. It's one of only a handful of accredited programs in the state. However, while South Carolina is reporting a shortage in that specific healthcare field, graduating students aren't promising to stay in the state. Cyganiewicz said the transient population in Horry County hurts the hiring process, and he gets a lot of recruiters for his student out of state. Programs in the Charlotte area, Florida and Texas frequently visit HGTC, recruiting EMTs and paramedics, he said. Visit the South Carolina EMS website and you'll find pages of job openings. Among them are private transport companies offering EMTs and paramedics up to a $20,000 signing bonus. Cyganiewicz said that offer has gone up. "So I think some of the issue is, well, it has to do with pay," Cyganiewicz said. "If you decide you want to be a nurse, you know, a nurse can probably enter the job market $18 to $20 an hour. If you're looking at an EMT entering the job market, you know, it's probably closer to the $11 an hour. The work schedules are going to be totally different there as well. A nurse is going to work 12 hours a shift and an EMT is going to work 24 hours or so." EMTs and paramedics can work in private transport or work in the firefighting field. Most fire departments, like Horry County's, require firefighters to be fire and EMT certified. That way, they can perform basic life-saving duties and also fight fires. Cyganiewicz said the Fair Labor Standards Act also may play into EMTs not lasting in fire departments. "Fair Labor Standard Act says that if we train you in fire suppression, we can work you 52 hours a week without paying you overtime. You can work 212 hours in a cycle before we have to accrue any overtime. So when you look at these guys on transport services, their sole job is to be an EMT or paramedic on a transport service. They're not exempt under FLSA. They're actually paid on a 40-hour work week. When you look at all these guys on Horry County Fire Rescue, they are exempt employees. They have to work 212 hours in a 28-day cycle before they accrue any overtime," Cyganiewicz said. The FLSA overtime law is federal, and not unique to the county. Unlike firefighter EMTs and paramedics, EMTs and paramedics who work in private transport will get regular overtime if working over 40 hours per week. All Horry County Fire Rescue firefighters receive their mandatory EMT training in house, while the department sends firefighters who wish to be paramedics through school at HGTC. HCFR spokesman Capt. Mark Nugent said the county pays for paramedic schooling for its firefighters. Paramedics also receive a $7,500 base salary increase, he added. Cyganiewicz said he thinks the state will start informing high school students of the career opportunities within the EMT and paramedic fields. He believes recruitment should start younger to help with shortages. He said schools aren't putting out enough EMTs and paramedics to keep up with the needs.